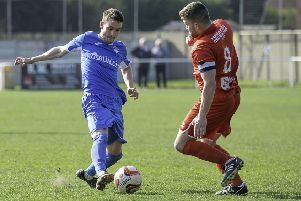 Hat-trick hero Jacob Hazel paid tribute to his teammates after Frickley Athletic recorded their biggest margin league win of the season in beating relegation threatened Carlton Town 6-0 in the Evo-Stik East Division. Hazel is closing in on a century of goals in his two spells with the Blues and moved onto 20 for the season in the league with the three he banged in at Westfield Lane last Saturday. He is now in third place in the goalscoring charts for the East Division, just two behind Pontefract Collieries’ Eli Hey, who will not play again this season after sustaining a serious injury in his team’s game last weekend. Hazel is looking forward to reaching his Frickley century, but also praised his teammates for the part they played against Carlton. He said: “That’s 98 goals now and hopefully the century is coming before the end of the season. “We’re just keeping going. We were very professional. “We’re not going to get into the play-offs, but we’re still being very professional about it. Lads are playing for their futures, whether it’s here or at other clubs. “It could have been 10, 11 or 12, their keeper had a worldie. But six you can’t ask more than that really. “They are fighting for their lives and started off pretty bright, we couldn’t get out. But once the first went in it flowed then. It was fitting that Frickley captain Hazel should bag a hat-trick in a game that was dedicated to the Kick It Out campaign for equality at every level of football. The player, who wore a special captain’s armband for the game, gave his full backing to the cause and said: “As a squad we all support the work that Kick It Out is doing. “Discrimination has no place in our game and if we can do anything as a squad to share that message we’re more than happy to do it. Hazel and his Frickley team now move on to host play-offs chasing Tadcaster Albion this Saturday. The Blues remained in 12th despite their latest win, but another success this weekend can lift them into the top 10 and they will feel they owe Tadcaster something after losing 4-0 to them back in September. Frickley are looking to run a coach to Loughborough for the game on Saturday, April 20, provided there is sufficient support to make it worthwhile. Cost will be £10 a person and the coach will depart North Elmsall at 1.10pm, returning immediately after the game around 5pm. Anyone who would like to travel can contact John Longbottom on 01977 647242 or see him at this Saturday’s home game. Frickley full-backs have been among honours this week with Ben Algar selected in the Evo-Stik East team of the year and Karl Byrne winning the club’s Bowlands Brewery player of the month award for March.